We know. Selling wholesale can sometimes be challenging. Manufacturers and distributors without a digitally enabled B2B ordering process often have to deal with issues that lead to frustrated customers and back office staff. When wholesale ordering is not intuitive and convenient, these stakeholders feel the burden of inefficiency more than anyone. As a result, different problems emerge. In 2019, suppliers are turning to a B2B eCommerce solution to solve for various challenges they run into on this front, by bringing B2B customer orders online. At Handshake, we’ve seen several companies confront these problems head-on by implementing our B2B eCommerce solution. In this blog post, we’ll discuss 5 common wholesale challenges we’ve helped suppliers overcome with B2B eCommerce in recent years. Challenge #1: Customers have stopped ordering from you. This one is frustrating. 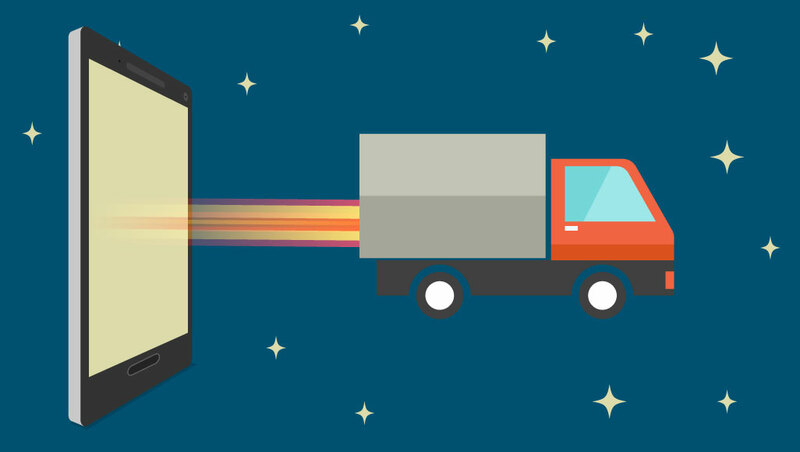 What do you do when accounts stop placing their wholesale orders through you? You can send them marketing emails, have your sales reps give them a call, or mail them a promotion, but at the end of the day, all your efforts will be for nothing if these accounts don’t like working with you. To become their supplier of choice again, you need to make it easy for buyers to order from you. The old-school methods of calling, faxing, emailing, and texting are exhausting and overwhelming. To bring these buyers back into your good graces, you need to offer them a modern B2B eCommerce solution. When you make wholesale ordering easy with a B2B eCommerce solution, you’ll start to see these buyers come back from the dead. Why? Because these accounts likely don’t have a personal vendetta against you. Business is business, and when you fix your outdated ordering problem, dormant accounts will reward you by placing orders again simply because you’ve made it easy for them to do so. That’s exactly what happened with Buff. Before they adopted Handshake’s B2B eCommerce solution, their wholesale ordering process was fragmented and clunky. Frustrated, many of their buyers in the outdoor industry decided it wasn’t worth the effort to carry their brand anymore. This concern, of course, went away once the wholesale ordering process was made effortless with our B2B eCommerce solution. An easy-to-use, and even enjoyable, B2B portal for their customer base was the B2B eCommerce solution these previously dormant accounts were holding out for. 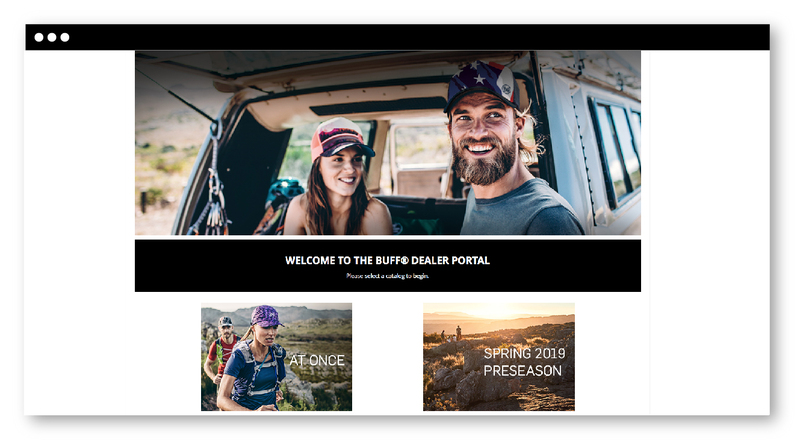 The B2B eCommerce solution we customized for Buff made online ordering easy for their buyers with separate digital catalogs for both preseason and at-once orders. On day one of their B2B eCommerce portal launch, Buff started to see inactive customers place orders again—and, within two months, 25 dormant accounts came back! ‍Challenge #2: Your company can't keep up with the flow of orders. Perhaps nothing is more frustrating to buyers and back office staff than the problem of ordering backlogs. Suppliers that are receiving more orders than they can feasibly input into their ERP, place a huge burden on their sales reps, customer service teams and data entry personnel. Ultimately, the gap in time between when an order is submitted and processed is felt by buyers who have to wait that much longer to get your products on their shelves. Not to mention, this problem limits your capacity to take more orders and increase your profits. When orders aren’t automatically synced, digitally, to your back office systems by a B2B eCommerce solution, issues abound! A good B2B eCommerce solution automates the order management process, allowing buyers to place orders directly from you online. Orders are then synced to your back office systems, speeding up fulfillment and reducing—or eliminating—data entry strain. That’s the story for Nuun. As business ramped up for the beverage brand, data entry staff just could not keep up with demand. All orders, coming in via email, PDF order forms, and Excel spreadsheets had to be manually entered into Netsuite, their ERP system. What’s more, once orders were submitted, fulfillment was often stunted by out-of-stocks due to a lack of inventory visibility. ‍Challenge #3: Your buyers need to multitask as they write orders. Here’s another one we hear all the time. Many buyers, especially retailers, are just too busy to sit down at their desk and place orders from you. Most the time, retail staff are running around the sales floor restocking items or helping customers. Unfortunately, taking time to order from your brand is not a top priority. Most B2B eCommerce solutions make it easy to browse digital catalogs and quickly place reorders—which is essential—but what fast-paced retail buyers really need is a convenient mobile B2B eCommerce solution. To save time, retailers need to be able to place orders shelf-side as they’re walking sales floors, restocking shelves and taking inventory—which requires a mobile B2B eCommerce solution. And no, I’m not talking about a mobile-optimized website. These buyers need a B2B mobile app with offline functionality and barcode scanning capabilities. Take leading pet supply distributor Pet Food Experts, for example. Independent pet stores, specifically, are known for their small layouts, lack of backroom space and operating with limited staff on hand—a perfect recipe for mobile ordering. After losing customers to competitors with mobile solutions, Pet Food Experts decided to rollout a mobile B2B eCommerce solution with Handshake. ‍Challenge #4: Many of your products aren't selling. Do you have some products that aren’t selling as fast as you’d like, or not at all? Before you assume that buyers aren’t interested in these items, consider this: maybe they just don’t know these products of yours exist! You can email buyers and remind them of these SKUs until you’re blue in the face, but unless these products are highly visible and discoverable at the time your buyers place their orders, they won’t ever sell the way you want them to. To combat this issue, suppliers are realizing the enhanced product discoverability made possible by digital catalogs in a B2B eCommerce solution. Your B2B customers will only buy what they can see. That’s what leading optical wholesaler Walman Optical recognized when they decided to give their customers a B2B eCommerce solution. Struggling to break customers out of stagnant ordering cycles and introduce new products into their eye practices, Walman Optical decided to roll out an easier ordering solution—Handshake Direct. 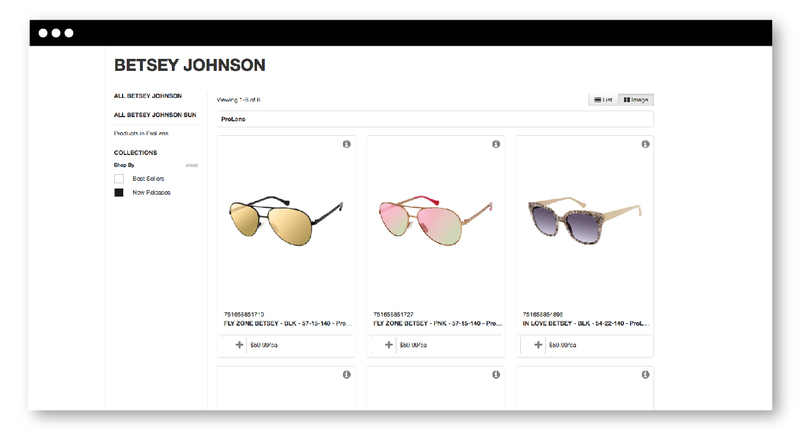 Walman Optical's B2B eCommerce solution enhances product discoverability by allowing buyers to select brands, categories and various filters to hone in on the frames they're interested in. By showcasing high-res images of their products in a digital catalog, their B2B eCommerce solution helped buyers discover new products to add to their carts as they were building their orders. Immediately average order value began to climb, resulting in a 5% uptick in sales over the previous year. Suddenly, those products that hadn’t sold in months began to clear out of the warehouse. ‍Challenge #5: Your business is ready to scale, but your ordering process is not. It’s great that your business is growing, but if your capability to handle the inflow of orders coming in doesn’t grow with your business, you’re not on a path to success. Ultimately, slow fulfillment times, overworked staff, and bad customer service experiences that result from inadequate order processes will bring your growth to a screeching halt. To truly set your business up for the best outcome, you need a B2B eCommerce solution to streamline order submission. When buyers can order at their convenience without needing back-and-forth interaction with your sales and customer service teams, you’ll exponentially increase your capacity to accept new orders. When Spicely Organics was ready to scale their wholesale business, they selected a B2B eCommerce solution that was up for the challenge. They chose to implement Handshake’s full platform, complete with a B2B eCommerce solution for online customer ordering and a mobile app to optimize the effectiveness of their sales reps and merchandisers. Streamlining the order capture process for both their field staff and customers helped them slash their data entry operational costs and cut the time their merchandisers spend in store by 50%—enabling them to see more customers each day. By eliminating outdated order processes, Spicely Organics set themselves up to scale their wholesale business for years to come. ‍Is your wholesale distribution business experiencing any of these problems? If you are: 1) you’re not alone, and, 2) we can help! ‍Handshake is a B2B eCommerce solution that was born out of the issues facing wholesale distribution companies. Our sole mission is to make B2B ordering as easy as possible, and the benefits speak for themselves (see above!). If you’re ready to take the plunge and implement a B2B eCommerce solution for your business, throw a 10-minute meeting on our calendar. One of our B2B eCommerce specialists is standing by to help you decide if your business is ready to shake up your sales process with a B2B eCommerce solution. © Copyright 2018 Handshake Corp. The Handshake logo is a Registered Trademark of Handshake Corp.